I’m trying to find something people can agree upon. I figured I’d start off simple. Everyone must like biscuits. Sorry to start off on a sarcastic note but I’m seeing trends and indicators that lead me to believe this country is in serious trouble for the next 4 years or less. And by less I think a breakdown in society might happen completely before 2020. I see controlled information/messages already. I see people coming to power who believe any voice of decent is worth crushing or jailing or who knows how worse. I see people so mad and frustrated that some protest you see now will seem like a simple church gathering. People are going to get hurt and its going to escalate. We are headed for an incredibly contentious period. And I think a good number of people don’t see this coming or don’t want to believe it now or when it starts to escalate, but just like the election, its right there under the surface and waiting to burst open. Trust and tolerance are becoming things of the past. I feel bad for our Police already. I hope I’m dead wrong about this feeling. I hope we can effectively and graciously return to conversation, negotiation and comprise. But given the position and tone and examples I’ve seen the last year and a half I don’t think that is coming from the group that is taking control. And I don’t see half the country just sitting on our asses and watching things turning bad or laws being imposed that take us back decades and to things not part of this country’s past. Or the worst thing, the truth being distorted from the top levels of Government. You know I don’t even want to turn on the news anymore. And I love NEWS. I work in the business. I don’t think this country has kept up in its ability to stay educated and informed. Ignorance and intolerance for any other position than ones own seems to be the norm. I don’t want to talk politics because it just disintegrate to arguments that can’t be won because nobody is listening. I don’t want to argue and fight. But if I feel my rights are being taken away then I will. If I feel threatened then I will defend myself and family and friends. And that means from people who just want to rampage for no good reason and destroy property or hurt others without reason. It also goes for a force that seems to be developing that reminds me of time in the 1930’s that I’ve watched and read about history. And my worry is that people don’t know history. And the old saying goes, “If you don’t learn from history or can’t remember it, you’re DOOMED to REPEAT IT. There are so few of us that have people from that era around. Those stories, feeling, words, actions and developments of events to me seem to becoming closer day by day. I hope this trend can be reversed. Because I remember those words and feelings and events from my parents. And that didn’t lead to a good era in history. I’m going to step away from politics and worry. I’m going to try to calm down myself and put events in perspective. I’m going to try to listen to those taking power and hope and pray they don’t abuse or mismanage it. I’m going to concentrate on my favorite sport watching (college basketball) and enjoying friends and family this holiday season. I’m going to try to spread some good will and hope. I’m going to try to look for positive signs to hang my hat on. But right below the surface is rage. Right below is my fear of being safe, for my family and friends. Right below are is my feeling to protect my rights. Right below is my feeling to protect myself. So its off to the range and spending some time looking at what item I’m going to add to my home and personal protection this weekend. And in the short-term, I’m going to remember that its VETERANS DAY and pay my respects to those that have served. I’m going to remember my parents who served, might go see them this weekend at Arlington. I’m going to thank my Son in-law for his service. I’m going to try to think positive thoughts about this country. May you all have a safe and pleasant day. Sorry about the political rant. I know it’s not my style here but I’m worried. Many are worried and I pray there is no need for it but we’ve only just begun to see some things. 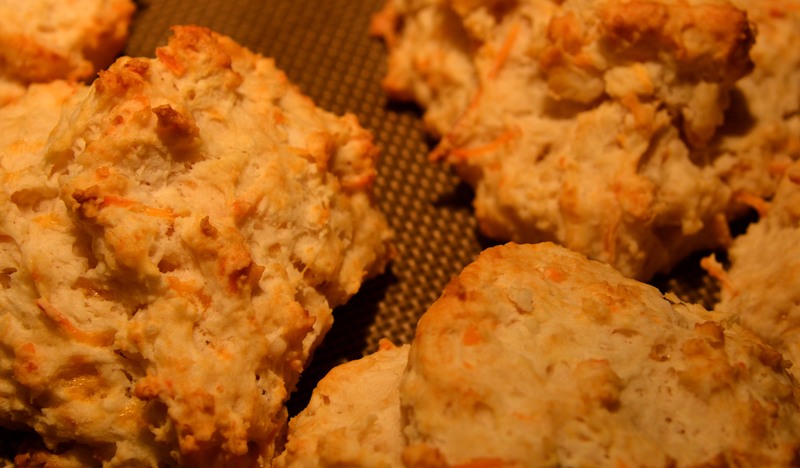 In the meantime, biscuits with real butter and honey – YES! Food is nice for comfort. Have you ever given thought to the past 20 – 25 years of civics, history and the humanities being taken out of our schools, only to be replaced with “item teaching” for English and Math as a big factor for the election outcome? It’s a shame what my children DON’T know about history and the democratic process. This will be the downfall for quite a while until someone can right the wrong in education policy.For now, I’m afraid for my children and warm biscuits sound like comfort to me! Glad the biscuits helped. I also am searching for thing of comfort and keeping my children close during this time.